A night light for boys! The perfect gift to liven up your space-themed nursery or playroom! 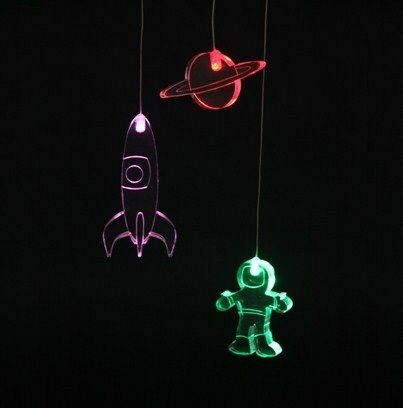 This multi-colour changing LED mobile is a great idea for boys who dream of outer space! 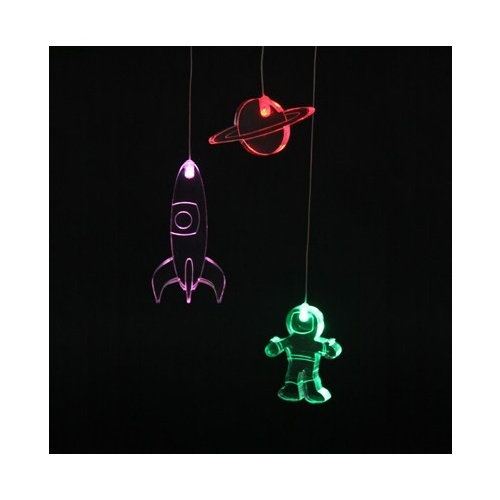 Consisting of three 1.5cm-thick acrylic shapes (a spaceman, rocket and planet) you will find your mobile makes a great night light as it morphs through all the colours of the spectrum! Suspended by three micro-wires from an acrylic ring and battery pod, the full length of your mobile is between 70-75cm. Perfect for above your bed! A novel idea for up and coming astronauts or rocket scientists! Also available in 'butterfly' and 'moon and clouds' designs. On/off switch located on battery pod - hanging hook included. 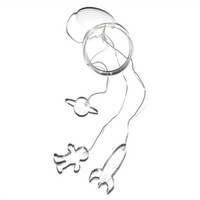 Acrylic shapes are approximately 7cm x 7cm x 1.5cm. Requires 3 x AAA batteries (not included). Rechargeable batteries can be used. Alkaline batteries last for approximately 30-50 hours if mobile is on all the time.